Two social events in Wellington, Florida, raised money for BROOKE USA and the EQUESTRIAN AID FOUNDATION. 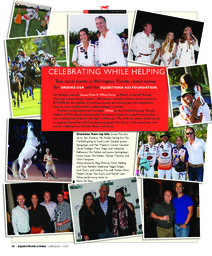 Nic Roldan’s second Sunset Polo & White Party in March to benefit Brooke USA was a true success. Nearly 1,000 guests, attired in white, raised more than $275,000 for the welfare of working equines and the humans who depend on them in some of the world’s underprivileged countries. Former Cavalia performers brought Althea to the Global Dressage Festival Stadium of Palm Beach International Equestrian Center for a performance that was created exclusively for the night in February. The sold-out event raised money to support Equestrian Aid Foundation programs for those in the equestrian community suffering from chronic illness and injury.